Police are a constituted body of persons empowered by a state to enforce the law. Bad cops are the product of bad policy. And policy is ultimately made by politicians. A bad system loaded with bad incentives will unfailingly produce bad cops. The good ones will never enter the field in the first place, or they will become frustrated and leave police work, or they'll simply turn bad. At best, they;ll have unrewarding, unfulfilling jobs. Political repression in the United States has reached monstrous proportions. 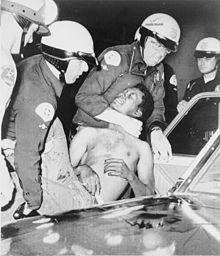 Black and Brown peoples especially, victims of the most vicious and calculated forms of class, national and racial oppression, bear the brunt of this repression. Literally tens of thousands of innocent men and women, the overwhelming majority of them poor, fill the jails and prisons; hundreds of thousands more, including the most presumably respectable groups and individuals, are subject to police, FBI and military intelligence surveillance. The Nixon administration most recently responded to the massive protests against the war in Indochina by arresting more than 13,000 people and placing them in stadiums converted into detention centers. ... Repression is the response of an increasingly desperate imperialist ruling clique to contain an otherwise uncontrollable and growing popular disaffection leading ultimately, we think, to the revolutionary transformation of society. This page was last edited on 23 April 2019, at 00:24.